Question: After the congress, we are constantly trying to hold on to the level we reached there despite the additional egoism we discover in us now. How is the state that is revealed to us now related to the process we are going through? Answer: We cannot ascend as we would like to since we don’t value our exertion, which is our reward. Now, after the convention, we have to be happy that we have lost the taste of unity and that we don’t feel any desire to connect. Our relations have become dull, tasteless and dark. But this is actually great since now we can try to fill the emptiness that is revealed by ourselves! We have to see this opportunity as a present. It is indeed a real gift from above. We wanted to bestow and now we have an empty void that we can fill! When will we feel such a void again? The state of unity in the convention was given to us as an example so that now we will be able to do the same thing by ourselves. In the convention we were given the “plus” so that now, when the “minus” appears we will do the same thing. The plus is the example that came from the Creator. Now we have a chance to repeat His actions and to reach the same result. The plus stands for an ascent and the minus stands for a descent. The Creator has given us an example, He has revealed to us the feeling, the form, and now you should do the same. We, however, don’t value this exertion and don’t feel grateful for it, but rather curse the Creator and resent what He has done with us. We neglect the chance to become like Him. 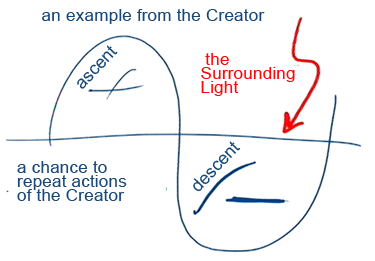 It is during a descent that we can provoke and draw upon us the Surrounding Light. The whole problem is that we have to do it but we don’t. What Especially Is Missing Is The Creator!